The morning of 23rd October brought forth an air of excitement in the PYP 2 classrooms. The PYP 2’s had been holding their breath in anticipation for this day. It was finally here! The day that they would venture out on their first field trip as a group of PYP 2 students. A whole day of exploring how to express their ideas through different mediums of Art at the BiB Art Center. The learners were excited and enthusiastic on the short bus ride to BiB Art. The day began with a brief storytelling session to begin the creative process, then by thinking of ideas and emotions that they would want to express. The learners were divided into two groups. 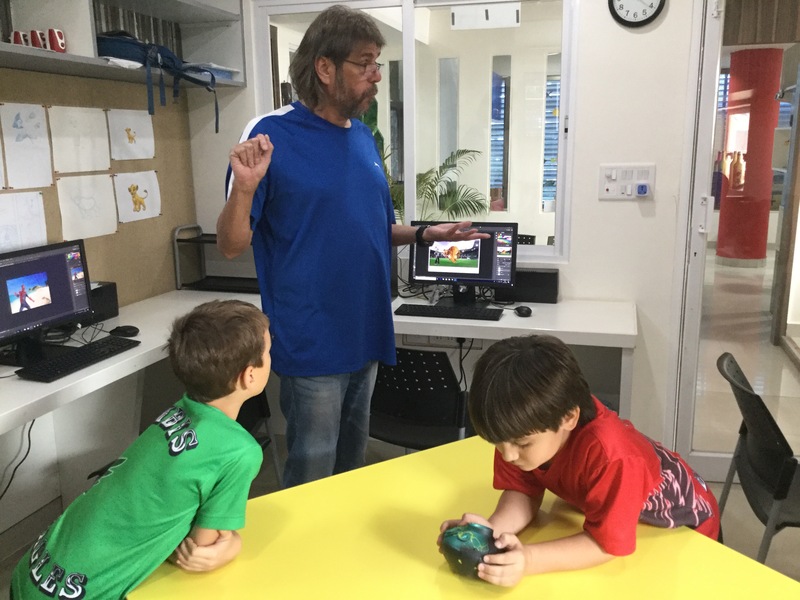 One group that would explore pottery and clay modeling for the first half of the day, while the second group explored wire sculpture and digital art. The groups would switch after reflecting on their artistic exploration and their lunchtime. The clay modeling was set up on a huge table with a lot of different tools and also slurry to glue the clay pieces together. 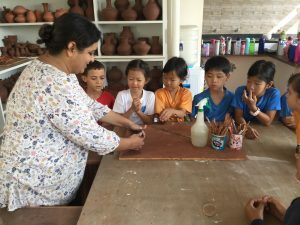 The instructor showed the learners how to make basic shapes and some simple clay modeling techniques such as; how to make a rough surface for the slurry to attach. It was enlightening to find that making clay models was a fun as well as challenging. Coming up with ideas to create something was sometimes a challenging too, but the learners looked around them and collaborated for inspiration. We saw some really creative pieces like a Ganesh, baskets made of spirals, trees, and snowmen being made by our young learners. The pottery wheel was an experience that had the learners queued up to engage with. It was an intense sensory experience and we needed the guidance of the instructor to hold our fingers and palms steady to shape pots, vases, and curved bowls. It was a great way to get messy and dirty, we also came to understand how the pressure of our fingers and the strength of our palms could manipulate the wet clay into a beautiful object. Making a wire sculpture was an eye opener for most of us, as we had to use tools such as pliers and wire-cutters to shape the wire. 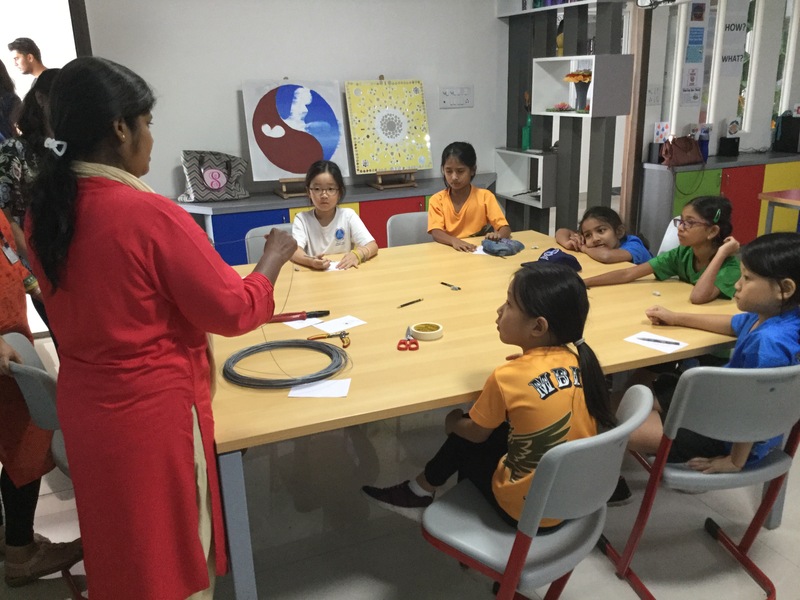 Initially, our young learners found it challenging to shape and curve the wire to make objects, but eventually with a lot of perseverance and muscle power and help from the instructor, they managed to make beautiful flowers, trees, and dragonflies! At the last station, the students could be found working on digital art. They manipulated to widely different backgrounds, choosing templates and adding objects of their choice. The learners made digital pictures of different animals together with different backgrounds. The learners were given a chance to use technology to make art that we do not have access to in school. It was plain for everyone to see that they thoroughly enjoyed each and every moment of this holistic, sensory exploration into different mediums and how to express themselves! As we further explored our unit of inquiry, we were fortunate to have Ms. Isabel come into our classes and show us how she uses her cultural dance to express herself. Ms. Isabel showed us how the Spanish culture influences the dress, the accessories and props to perform the Flamenco dance. 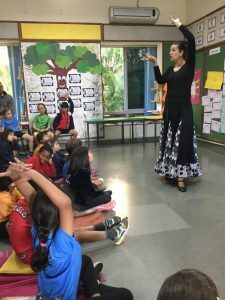 Our PYP 2 learners were huge risk-takers as they joined Ms. Isabel on the floor to try out how to use the fan to dance and also to try out a few steps of Flamenco! A big thank you to Mr. Sangamesh and his team of highly skilled instructors at BiB and the ever graceful and exotic Ms. Isabel for leading us into this wonderful investigation of how to express ourselves.